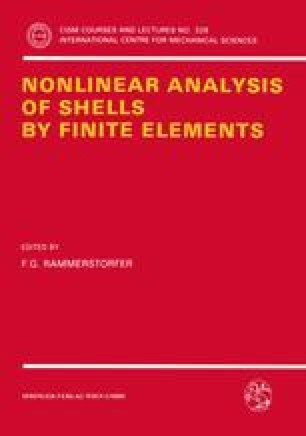 The investigation of the nonlinear response of shell structures requires besides knowledge about geometrical and material nonlinear behaviour the insight in the stability response. Here three main aspects arise. These are associated with the detection of singular points (e.g. limit or bifurcation points), the path-following in the pre- and postcritical range and a branch-switching between different paths. These problems are treated in this paper using the finite element method. For this purpose we summarize the necessary finite element formulations, where we emphasize the higher order derivatives. In a next section we present a brief overview on path-following methods. A main aspect of stability analysis is the detection of singular points. Thus, we introduce a definition of singular points, derive methods to detect the type of singular point and report possibilities to treat the stability considerations in an accompanying way. Furthermore we discuss modern concepts to calculate singular points directly using so called extended systems. Remarks on branch-switching procedures terminate the theoretical considerations. At the end of the paper some numerical examples are given to illustrate the derived methods and algorithms.